Between 2000 and 2003, AP staff writer Peter Lippman produced a series of dispatches for AP’s online newsletter On the Record about the courageous efforts of Bosnian Muslims to return home after the war. 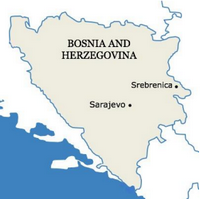 This series focuses on Srebrenica and opens with a description of the 1995 massacre. Iain Guest from AP visited Bosnia in 2004 and picked up the story with blogs that described the precarious situation of the returnees and international efforts to bring the perpetrators of the massacre to justice. Iain returned in 2008 on the anniversary of the massacre. His blogs can be found in postings 16 and 17 below. This page should be read in conjunction with the BOSFAM partner pages. Every July 11, the remains of those who died during the 1995 Srebrenica massacre, and were identified in the previous 12 months are re-buried at a solemn ceremony at Potocari, scene of the massacre. BOSFAM members have re-buried scores of family members since the Potocari cemetery opened in 2003. One of those re-buried in 2012 was 17-year-old Alem Paric, the nephew of Beba Hadzic, BOSFAM’s founder. This video of Alem’s re-burial was taken by Peace Fellow Claire Noone. For information on the quilts made by our partner, BOSFAM, in commemoration of the victims of the massacre, click here.